Clothing Hacker: Fabricista Fashion Challenge #1 finished product! 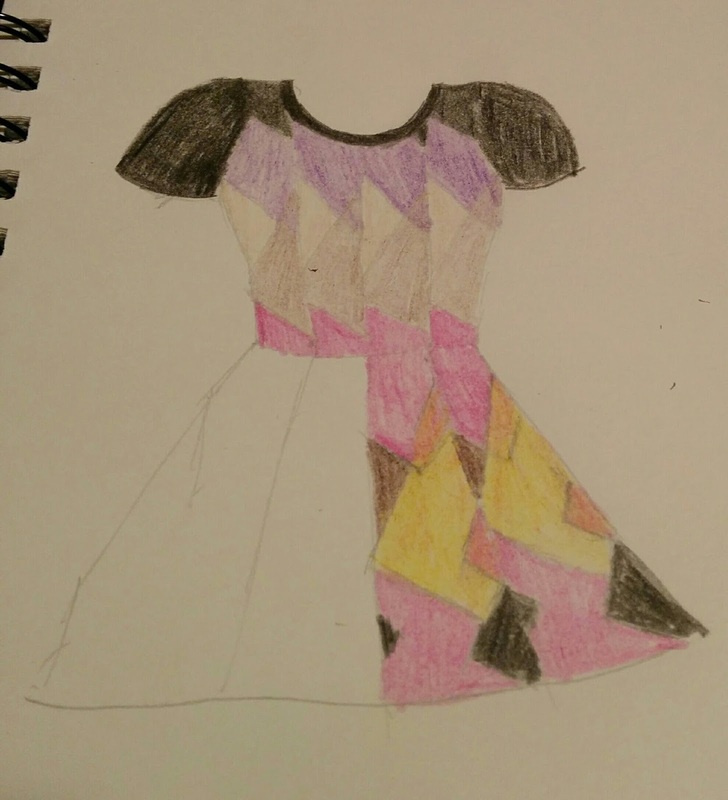 I made a dress!! Is anyone really surprised? 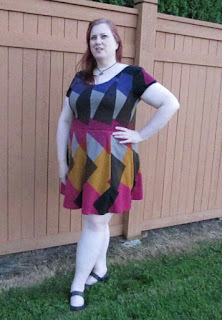 But this isn't just any dress, it's a gorgeous carefully pieced work of art (if I do say so myself.) It is absolutely my favorite thing I've ever made so far. When the fabric arrived, I was very pleased with the quality and the colors are just so pretty and perfect for fall. 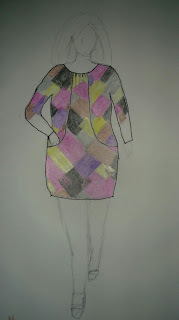 But the more I contemplated and sketched ideas, I kept finding my sketches pulling in the colors, but since I was usually away from the fabric when I was sketching, I just kept forgetting that the scale of the pattern was very large, as you can see in this photo of it draped over my dress form. 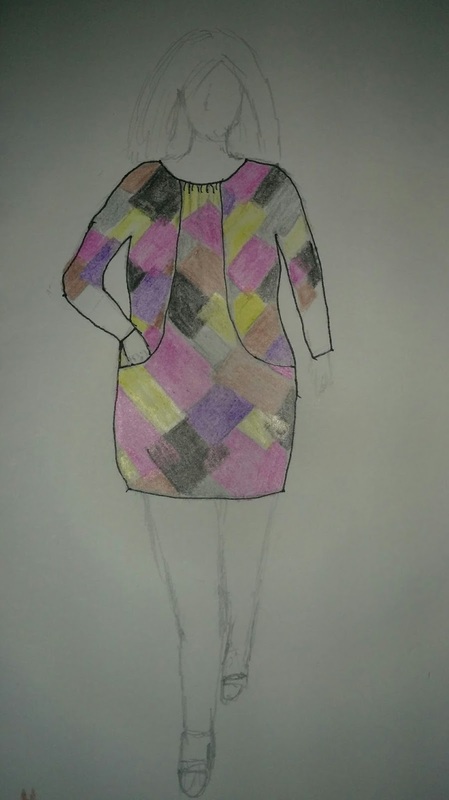 Although I liked what I sketched (badly,) they didn't accurately reflect what the garment would look like in the actual fabric. 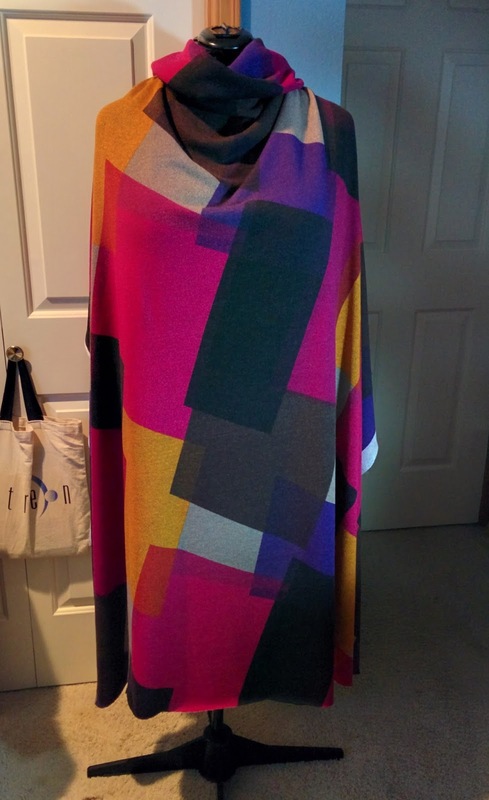 I just couldn't wrap my head around how to use it in a way that I'd be able to either pattern match across seams or make it very apparent that I didn't intend to pattern match (by rotating the fabric, for example.) I also didn't like the idea of the mustard or the hot pink colors being close to my face. 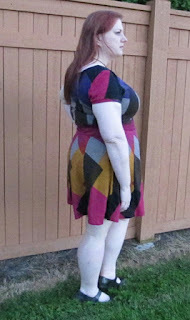 I don't find those colors very flattering on me, so I was hoping to be able to place them far from where they can clash with my skin tone. 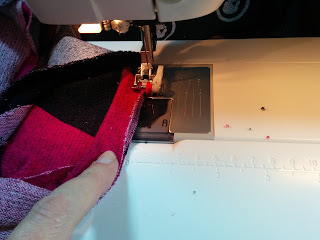 So, I sat and looked at the fabric laying out on my cutting table, sketchbook in hand and I remembered a technique I had seen not too long ago in a sewing magazine that I had been wanting to try. Unfortunately, I can't remember which magazine and even leafed through a few to see if I could find the article I was thinking about, with no luck. But the technique was to take a fabric with a large pattern repeat and cut out a particular portion of the repeat several times and sew them back together to make a new design. 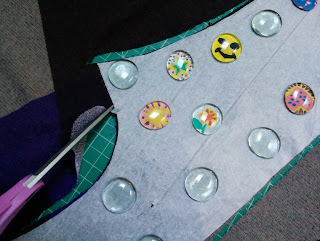 So, I decided to use my TNT Kitschy Coo Lady Skater pattern and divide each bodice and skirt piece vertically into 2 pieces, adding seam allowances between them, thus making 4 panels across the width of the dress. 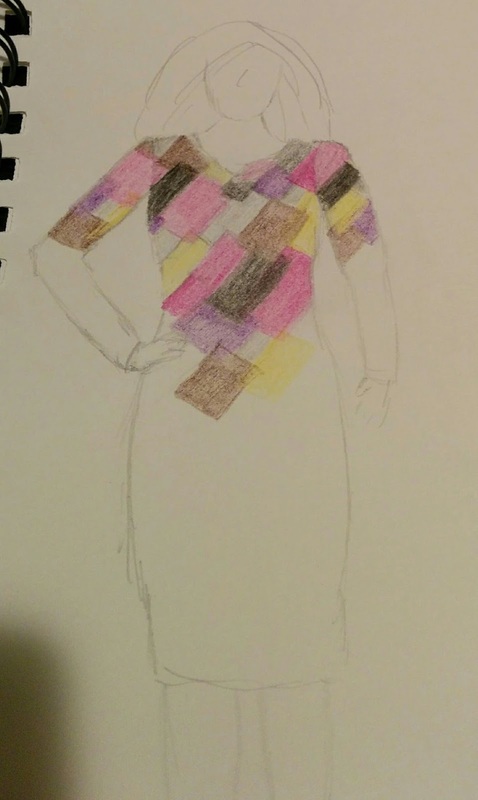 I identified where on the fabric I would lay out each piece and sketched out the design, trying to keep the scale as accurate as possible, to see how I'd like it. I loved it, so I settled on that as a plan, even before I finished coloring it in. 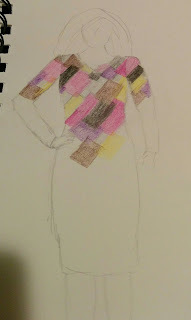 My colored pencils just don't do the colors in this fabric justice! As shown in the photo above of my previously altered Lady Skater front bodice piece, I drew a vertical line from the bottom, halfway between the side seam stitching line and center front fold line (since seam allowances hadn't been added yet) up to where I thought it would look aesthetically pleasing and did the same for the bodice back. For the skirt I did the same, but I marked exactly halfway between the stitching lines at both the top and the bottom of the pattern. I then copied each of the pattern halves onto tissue paper and added seam allowances at the fold lines and to both halves where the original patterns were split in the middle. 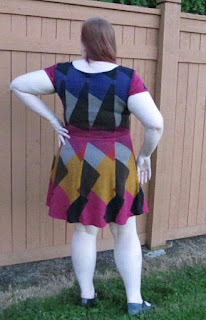 My tips for working with sweater knits. First of all, there are many different types of sweater knits. This one was what I’d consider a pretty stable sweater knit. The weave is tight and the fabric is opaque, but I’ve worked with very loose weave sweater knits before. 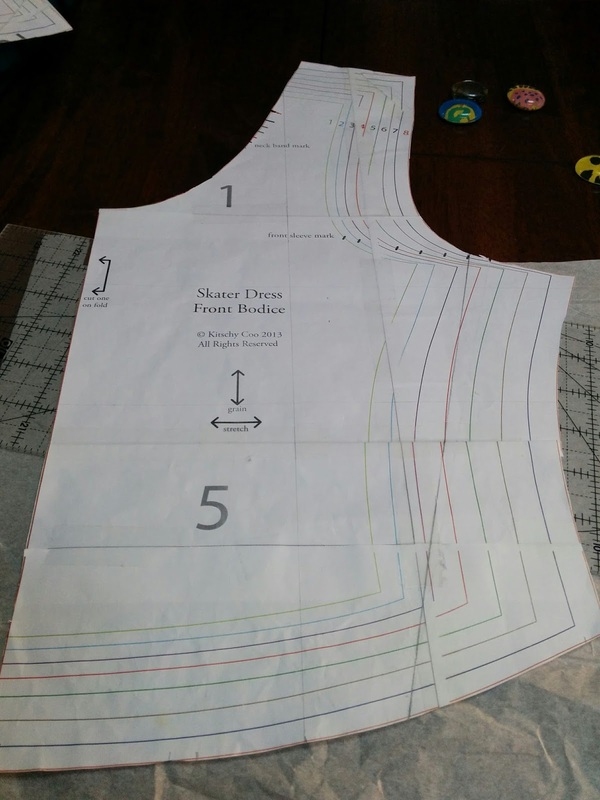 I think Seamwork’s guide to sewing with sweater knits is a good starting point. In addition to the tips Seamwork provide, these are the things I have found helpful when I work with sweater knits. I tend to be a fairly lazy sewist most of the time since I’m just making clothes for myself, but seeing how great this dress turned out actually made me take the extra time to hand sew an invisible hem. I overlocked the raw edge, pressed it up 5/8” and catch stitched it. The fabric is nice and lofty, so I was able to catch a few threads of the body without anything even showing on the right side. Overall, this fabric was a dream to work with. It pressed really well, the seams absolutely disappear into it and it’s just gorgeous. I got to use a technique I’ve been wanting to use for a while and it made an amazing dress that I’m incredibly proud of and have been showing off to everyone who’ll pay attention to me. 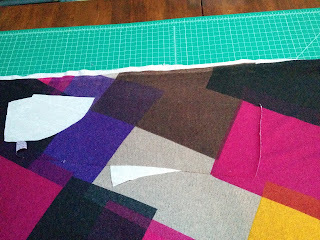 All of the projects are up on the Fabric Mart blog and I definitely have some stiff competition. So go check out all the entries and vote for the project you liked the best. Very cool! You did a lot of careful cutting and pattern work on this one! Good luck on the next challenge! I can't wait to get sewing. Congrats on your win for Challenge 1, you did an excellent job. That's actually not the particular article I'm thinking of, but that technique is very similar and I would love to find the perfect panel to do that shattered effect with too. The article I'm remembering does basically exactly what I did -- created a completely new fabric design from a large scale print. And I'm pretty sure I read the article at least a year ago, maybe more. It's particularly driving me crazy because I thought I read it during one of my catch up sessions where I went through a bunch of magazines and took photos of the articles I wanted to be able to know how to find again easily, but apparently I didn't. Or I somehow lost the photos. Grrr. Thanks for the help, though!